Editor’s Note: Roger Conrad and Elliott Gue will share their expertise with investors at the upcoming MoneyShow San Francisco, which will take place Aug. 21 to Aug. 23 at the Hilton Union Square. Roger will give five presentations on his favorite themes for income investors. Registration for this must-attend conference is free. Sign up at MoneyShow.com or call 1-800-970-4355 and tell them that Roger Conrad and Elliott Gue sent you. Kinder Morgan Inc. (NYSE: KMI) recently announced plans to consolidate its satellite entities by acquiring the outstanding equity interests in El Paso Pipeline Partners LP (NYSE: EPB), Kinder Morgan Energy Partners LP (NYSE: KMP) and Kinder Morgan Management LLC (NYSE: KMR). These transactions, worth a total of $70 billion, will create a mammoth C corporation that will boast more than 80,000 miles of pipelines and 180 terminals and sport an enterprise value (equity plus debt) of about $140 billion. It’s tempting to interpret this blockbuster transaction as a major watershed for master limited partnerships (MLP) or a referendum on the structure’s viability. After all, Chairman and CEO Richard Kinder invested 17 years into building the second-largest MLP by market capitalization–only to abandon the structure for a C-corp.
Kinder Morgan Energy Partners and other large MLPs get a bad rap from investors because they require greater incremental cash flow to drive distribution growth and face a higher cost of capital than nimbler partnerships in the early chapters of their growth stories. We regard Kinder Morgan Inc.’s move to consolidate its associated limited partnerships as yet another reminder that these underappreciated names have many levers that they can pull to unlock value for unitholders and improve their growth prospects. After PBF Energy (NYSE: PBF) spun off PBF Logistics LP (NYSE: PBFX) earlier this year, most publicly traded independent refineries have spun off their pipeline and storage assets as publicly traded partnerships. The wave of oil and gas producers in the Marcellus Shale that have monetized their gathering assets–small-diameter lines that transport oil and gas from the wellhead to processing plants and larger pipelines–looks set to continue. Following in the footsteps of Chesapeake Energy Corp (NYSE: CHK) and EQT Corp (NYSE: EQT), Antero Resources (NYSE: AR) and a joint venture between Noble Energy (NYSE: NBL) and Consol Energy (NYSE: CNX) have announced plans to create MLPs to house their midstream assets in the Marcellus Shale and provide a platform for future development. Even larger integrated names are looking to get in on the action. Shell Midstream Partners LP (NYSE: SHLX), a spin-off of Royal Dutch Shell’s (LSE: RDSA, RDSB; NYSE: RDS A, NYSE: RDS B) pipelines and processing assets, earlier this summer filed its initial registration statement with the Securities and Exchange Commission (SEC). Meanwhile, Hess Corp (NYSE: HES) also announced plans to create and list an MLP that will own midstream assets that support the parent’s operations in North Dakota’s Bakken Shale. Last year brought a bumper crop of MLP IPOs, while 10 more went public this year and four prospective publicly traded partnerships have filed their S-1 registration statements with the SEC. However, investors should note that this year’s tally of forthcoming IPOs excludes any registration statements that were filed confidentially by “emerging growth companies”–outfits with less than $1 billion in annual revenue. Kinder Morgan Inc.’s consolidation of El Paso Pipeline Partners, Kinder Morgan Energy Partners and Kinder Morgan Management shouldn’t be misconstrued as an outright repudiation of the MLP structure. In actuality, this strategic move reflects the latest evolution of an ongoing trend among the largest partnerships. The five biggest MLPs by market capitalization–all of which have been public for at least eight years and have amassed huge asset bases–need to generate significant sums of cash flow to grow their distributions. Kinder Morgan Energy Partners, for example, needed to generate almost 28 times as much incremental cash flow as EQT Midstream Partners LP (NYSE: EQM) to support a 10 percent hike to its quarterly payout, assuming a flat unit count. For these reasons, a number of MLPs have removed this yoke by purchasing their general partners. We last saw an upsurge of these transactions between 2008 and 2010, when Buckeye Partners LP (NYSE: BPL), Enterprise Products Partners LP (NYSE: EPD), Magellan Midstream Partners LP (NYSE: MMP), MarkWest Energy Partners LP (NYSE: MWE) and PVR Partners LP all took out their publicly traded sponsors to improve their competitiveness. More recently, growth-constrained MLPs have pursued alternative means to reinvigorate their prospects and appeal to investors. Faced with an unsupportive general partner and a wave of expiring contracts on its long-haul natural-gas pipelines, Boardwalk Pipeline Partners LP (NYSE: BWP) bit the bullet and slashed its quarterly distribution by 81 percent earlier this year–a painful move for its unitholders. 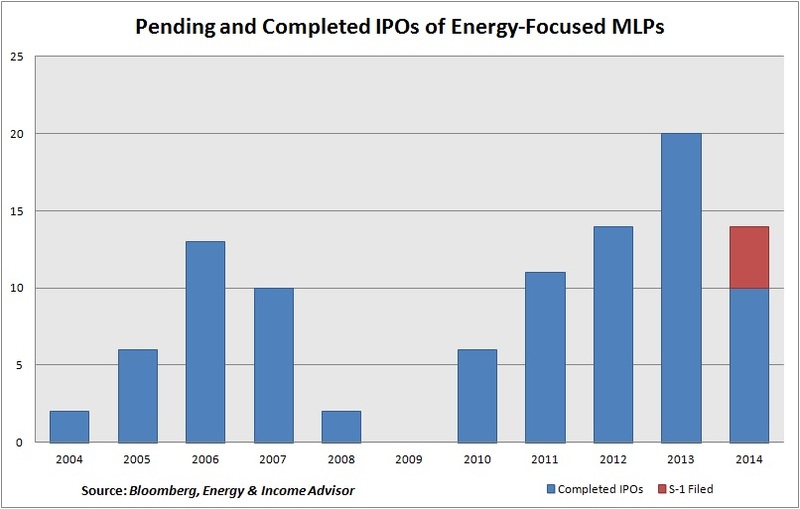 Meanwhile, Energy Transfer Partners LP (NYSE: ETP) has addressed its growth constraints through a series of kick-up transactions whereby the MLP transfers assets to its general partner, Energy Transfer Equity LP (NYSE: ETE), in exchange for the latter retiring some common units to bolster the partnership’s distribution coverage. For example, after Energy Transfer Partners purchased Sunoco, the MLP kicked up the general partner-interest in Sunoco Logistics Partners LP (NYSE: SXL) to its general partner. Energy Transfer Equity also acquired Trunkline LNG, which owns an import and regasification terminal in Lake Charles, from Energy Transfer Partners in exchange for retiring 19.7 million of the MLP’s common units. Finally, long-suffering Enbridge Energy Partners LP (NYSE: EEP) began to turn around its growth prospects by spinning off its gas-related infrastructure as Midcoast Energy Partners LP (NYSE: MEP). Equally important, Midcoast Energy Partners gives Enbridge Energy Partners a vehicle to raise low-cost capital to expand its crude-oil and refined-product pipelines. And Enbridge Energy Partners could eventually transfer its general-partner interest in Midcoast Energy Partners to its parent, Enbridge (TSX: ENB, NYSE: ENB), in exchange for retiring some of its common units or MLP-qualifying assets. 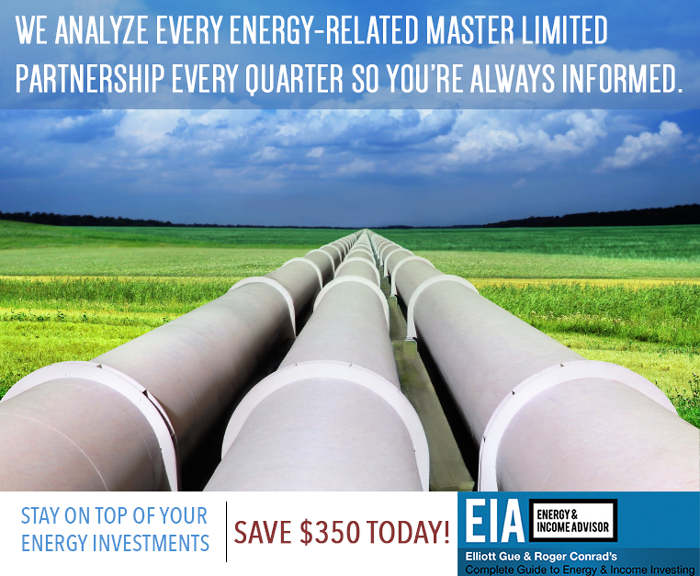 More recently, Enbridge announced plans to modify Enbridge Energy Partners’ partnership agreement and restructure its IDRs, cutting the MLP’s cost of equity capital. With Kinder Morgan Inc. generating the majority of its cash flow from its equity and general-partner interests in its underlying MLPs, restructuring Kinder Morgan Energy Partners’ incentive distribution rights wasn’t a realistic option. Detractors also overlooked the potential for the MLP to lower its cost of capital by taking out its general partner, Kinder Morgan Inc. Such a transaction would unlock significant value for unitholders over the long term, but would likely entail significant expense and complications. Another option would have been be for Kinder Morgan Inc. to take a page out of Energy Transfer Equity playbook and acquire another MLP to which Kinder Morgan Energy Partners could sell some of its assets in exchange for unit retirements or IDR relief. Kinder Morgan Energy Partners’ exploration and production assets would be ideally suited to this strategy. Rather than regarding Kinder Morgan Inc.’s consolidation of its associated limited partnerships as a referendum on the MLP structure or the end of an era, investors should view this move as a fresh start for the midstream giant–an opportunity to reshape itself to meet the demands of today’s marketplace and competitive environment. When Richard Kinder and William Morgan acquired Enron Pipeline LP and began to build Kinder Morgan Energy Partners’ energy empire, US oil and gas production was on the wane and the MLP could scoop up midstream assets for a song. At the time, MLPs were a niche security class that income-seeking investors prized for their reliable distributions, above-average yields and tax advantages. These investment vehicles appealed primarily to buy-and-hold investors looking to accumulate distributions. Growth opportunities came primarily from asset acquisitions and the efficiencies that come from adding scale. Although the Alerian MLP Index still offers a superior yield to real estate investment trusts and other dividend-paying security classes, the growth opportunities fueled by the US shale oil and gas revolution have attracted more institutional investors and shifted the focus from yield to yield compression. A consolidated Kinder Morgan Inc. will be better equipped to thrive in this brave new world. First and foremost, the transaction will eliminate Kinder Morgan Energy Partners’ burdensome IDRs and lower the yield that had elevated the MLP’s cost of capital and eroded project economics. Not only will Kinder Morgan Inc.’s lower cost of capital enable the firm to pursue organic growth projects that had failed to meet its hurdle rate, but the firm should also be able to make waves through mergers and acquisitions. Potential takeover targets include Markwest Energy Partners LP (NYSE: MWE), a leading gatherer and processor in the Marcellus Shale, that would increase Kinder Morgan Inc.’s incremental exposure to growing production of natural gas and natural gas liquids (NGL) in the region. Targa Resources Corp (NYSE: TRGP), which owns an equity and general partner interest in Targa Resources Partners LP (NYSE: NGLS), would be another takeover candidate and would provide the NGL fractionation and export capacity to support the Kinder Morgan complex’s proposed Utica-Marcellus Texas Pipeline to ship volumes from the Marcellus Shale to the Gulf Coast. However, as a C-corp Kinder Morgan Inc. will also be able to pursue acquisitions of assets or companies that don’t generate MLP-qualifying income. And Kinder Morgan Inc. could lower its cost of capital even further by spinning off some assets as smaller, growth-oriented MLPs that should command a premium valuation–a particularly appealing prospect if the market applies a C-corp discount to the stock. Consider that Tallgrass Energy Partners LP (NYSE: TEP), which acquired Kinder Morgan Energy Partners’ interest in the recently reversed and upgraded Rockies Express Pipeline, sports a distribution yield of less than 4 percent. By comparison, Kinder Morgan Energy Partners yielded more than 7 percent at times this year. With all these options at his fingertips, we can’t wait to see how Richard Kinder uses this reset to build wealth and unlock value for shareholders. It should be an interesting, and rewarding, ride.